Q: We are a hospital and if there was a fire, say at the northeast part of the building does everyone throughout the whole building have to evacuate the building or only the ones on that side of the building? Same thing with fire drills; does everyone have to evacuate? A: No… Everyone does not have to evacuate. You never want to evacuate the building unless it is absolutely necessary. Evacuation should always be horizontal and local. This means if 4 west has a fire, then the occupants on 4 west evacuate to 4 east, (or 4 north, or 4 south). You do not take patients down the stairs unless it is absolutely necessary. If you do have to evacuate vertically, you use an elevator that is not actively involved with the fire to evacuate the patients. 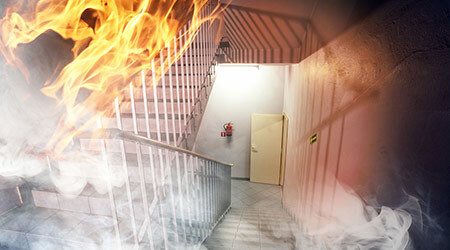 Forget all those signs that say “In Case of Fire – Use Stairs”. That does not apply to evacuating patients. The Life Safety Code actually says it is permissible and recommended that you use elevators in the evacuation of patients, as long as the elevator is not actively involved in the fire. For fire drills, you use simulated patients (put a staff member in a wheelchair and observe the other staff members push the wheelchair to an adjoining smoke compartment). You must observe that they did evacuate a simulated patient to the adjoining (horizontal) smoke compartment. That is why it is important to identify which set of cross-corridor doors are smoke barriers.